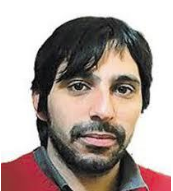 Ramiro Albrieu is an Argentine economist and researcher. He has published over a dozen papers relating to the macroeconomics of Latin America. Albrieu serves as an economic advisor to the Economic Commission for Latin America and the Caribbean and also to the United Nations Development Programme. Previously, he has served as a consultant to several branches of the Argentine government and has co-authored several government publications on macroeconomic forecasting. Albrieu received his degree in economics from the University of Buenos Aires in Argentina and is a current professor at the university.